Featuring 4-way stretch technology, the Speedo Fit Splice muscleback ladies swimsuit provides a soft feel and maximum comfort during your regular training sessions. For a supportive fit, the swimming costume has Comfort straps and bust support, whereas a muscleback style gives you ease of shoulder movement. To block 98% of UVA and UVB rays, there is UPF 50+ sun protection and the swimsuit is quick-drying, as well as chlorine and fade-resistant thanks to Endurance®+ fabric. Additionally, for the perfect amount of coverage and great mobility, it offers a medium leg height. for submitting product information about Speedo Fit Splice Muscleback Ladies Swimsuit We aim to answer all questions within 2-3 days. 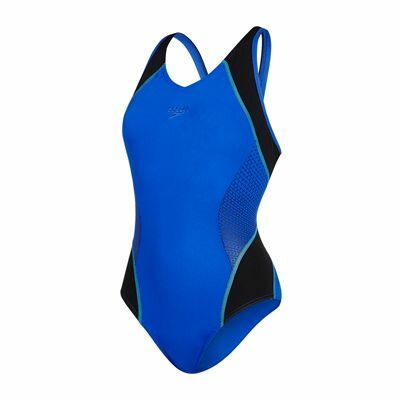 for submitting product information about Speedo Fit Splice Muscleback Ladies Swimsuit. We aim to answer all questions within 2-3 days. If you provided your name and email address, we will email you as soon as the answer is published. for submitting product review about Speedo Fit Splice Muscleback Ladies Swimsuit.